PLEASE Open Safe Sleeping Space, Yes You!! 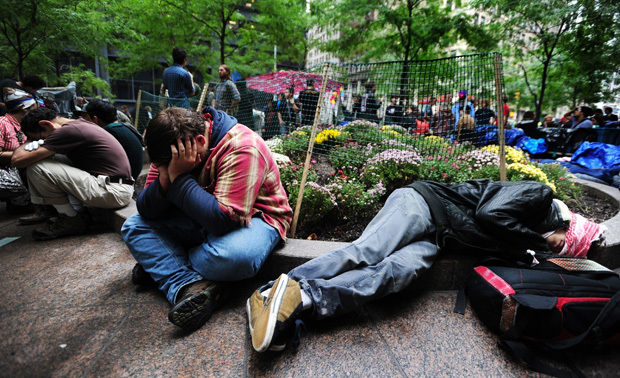 EMERGENCY- Freezing weather and people with no shelter. Cold weather, especially over an extended period of time, takes a heavy toll on the health and well-being of the most vulnerable members in our community. A few years ago, a small household in Eureka, made its garage available as a safe sleeping space for people with no shelter. The household and a group of friends (many PEOPLE PROJECT folks) organized the space in response to the dangerous weather and police conditions on the street. It was actually quite simple. Prior to opening the safe sleeping space, we discussed how we thought it would work best. One of the things decided beforehand was that we would make the space available for 11 nights (December 21-31), and would be explicit about that time frame, so that people sleeping there could depend on a stable schedule. At this time, opening your home or some covered space is imperative. We were so grateful for the garage, and all went well. Being only a temporary situation, we are reaching out to you, asking you to open your garage, yard, or big room for whatever time you decide is possible. We imagine a rotating emergency sleeping space. We have found that when a community cooperates and shares in the protection of its most vulnerable members, the result is a vital sense of security experienced by all. The people who shared their garage and those of us who supported and helped coordinate that emergency shelter space are available to talk with you about our experiences. We are eager to assist you in many ways if you are able to open up a sleeping space. Ways we can assist you include: collecting floor padding, blankets, sleepware, and other necessary warm things (the garage just used had a cement floor); driving folks who need a ride to and from the space; and being present in the sleeping space overnight. The volunteer-run PARC (Peoples’ Action for Rights and Community) in downtown Eureka fully supports the creation of temporary or permanent dignified community sleeping spaces. PARC is available, for any set-up you may provide, as a phone contact, a donation drop-off, and a dedicated resource for people offering or utilizing a safe shelter. People can and do freeze to death in cold or wet or windy weather.. here we have all three at once. And the police continue to harass people and ruin their gear in the rain and cold. 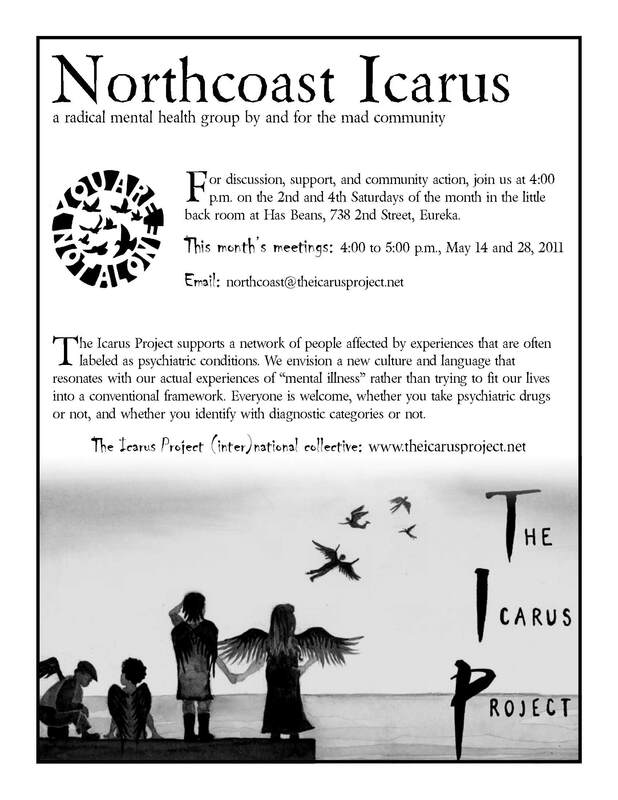 Please call and/or email if you want to talk about opening a space up yourself. It is freezing at night, and we can make a way through these hard times together. then use the front gate to go in/out. – every night through the night of Dec 31st. If you need anything, please feel free to ask. 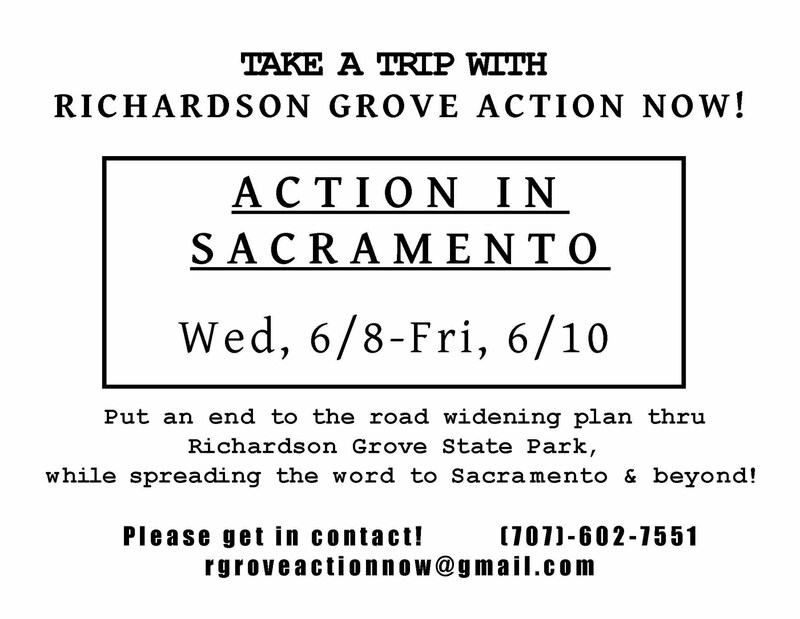 Richardson Grove Action Now To Sacramento Wed, June 8th! 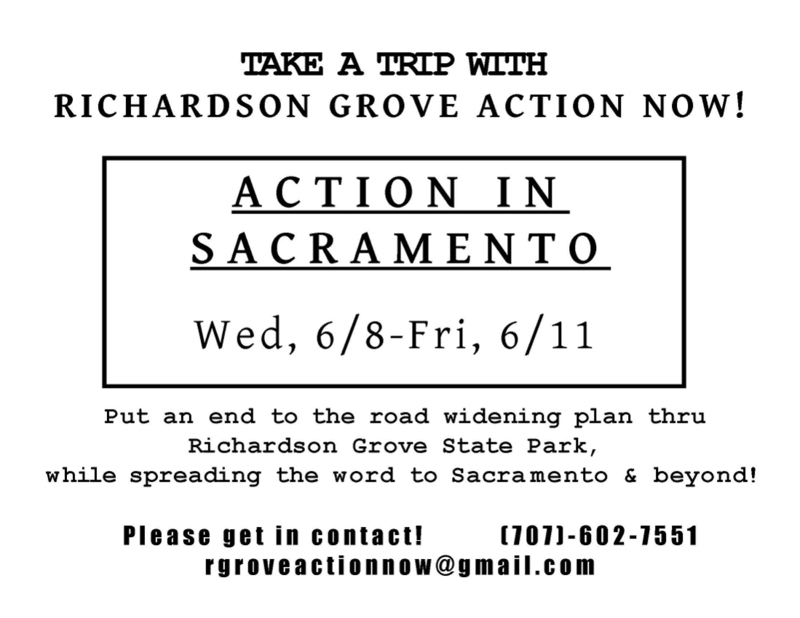 Richardson Grove Action Now invites you on a trip to Sacramento! We plan to leave SOON. We’ll venture out on Wednesday, June 8th and will return June 10, Friday night. We will be bringing a loud temporary presence to Sacramento regarding the road widening- which would bring a PERMANENT impact to our lives and to the survival of ancient redwoods. If you are not able to join us, in person, on this trip, please support the action by contributing food or money. We are trying to raise $650 for travel expenses. And the food is for the people. If you really want to go and you think there is some obstacle, call us. If you are in the Bay area, we would like to come there for the night and bring you with us! We are also considering, on the way, visiting the spiritual encampment/action at Glen Cove. Never forget 1985! Now is the time to free the MOVE 9! Friday May 13 at 8pm, watch “August 8, 1978” and other footage to understand the unjust incarceration of the MOVE 9 and how the battle for their release lead to the bombing of MOVE in 1985. 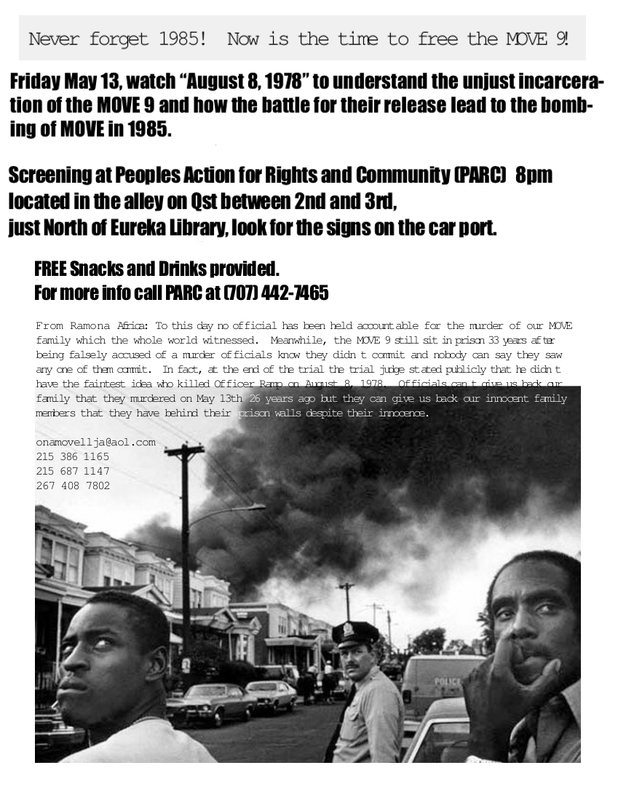 Free Film Screening at Peoples Action for Rights and Community (PARC). PARC is located in the alley on Qst between 2nd and 3rd, just North of Eureka Library and toward the Samoa Bridge. Look for PARC signs on the carport. From Ramona Africa: To this day no official has been held accountable for the murder of our MOVE family which the whole world witnessed. Meanwhile, the MOVE 9 sit in prison 31 years later, being falsely accused of a murder officials know they didn’t commit and nobody can say they saw any one of them commit. In fact, at the end of the trial the trial judge stated publicly that he didn’t have the faintest idea who killed Officer Ramp on August 8, 1978. Officials can’t give us back our family that they murdered on May 13th 26 years ago but they can give us back our innocent family members that they have behind their prison walls despite their innocence. Ona MOVE! The MOVE Organization is releasing this communique to once again remind folks of the vicious and deliberate massacre of our innocent family members, including babies, by the government on May 13, 1985. We will never let this official treachery be forgotten and we will never stop grieving for our murdered family members. Neither will we let officials divert people from what is really behind that brutal attack. It had nothing to do with any complaints from neighbors. Officials don’t care about people complaining, this is proven in the fact that officials are still ignoring the complaints of Osage Ave. residents about their rebuilt houses. The root of the official massacre of innocent MOVE members is our unrelenting fight for the release of our innocent family members known as the MOVE 9. Officials dare to call our family murderers based on the false accusation of the murder of one cop while eleven MOVE men, women, and babies and numerous animals were murdered by officials and nobody has ever been charged with their murder. The MOVE 9 are serving 30-100 year sentences each despite their innocence and officials are collecting pensions despite their guilt. People that choose to believe that the MOVE 9 are guilty have to explain the trial judge who sat through the trial saying at the end of the trial that he didn’t have “the faintest idea” who killed James Ramp on August 8, 1978. At this point, MOVE people have been in prison three years past their 30 year minimum, they have seen the parole board three times and been denied three times because they won’t lie and say they’re guilty when in fact they are innocent. We encourage people to keep the pressure on the PA Parole Board, don’t let up, keep those letters and calls coming. Consistency is strength, it’s power.